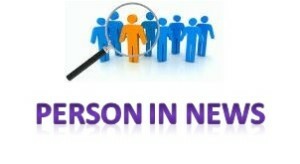 Dear Readers, Read Persons in News which is a very important Part of Current Affairs in IBPS PO Mains General Awareness section. -The Founder and Chairman of Bharti Enterprises Sunil Bharti Mittal was appointed as Chairman of GSM Association (GSMA). -Paul Beatty (54) has won the 2016 Man Booker Prize. With this he becomes the first US author to win this prestigious literary award. He was bestowed with this award for his racial satirical novel ‘The Sellout’ at a ceremony held in London’s Guildhall. -The board of India’s largest conglomerate Tata Sons Ltd has removed Cyrus Pallonji Mistry (48) as Chairman. However he will remain a director of the individual companies. -Noted British statistician Sir David Cox (92) was awarded inaugural recipient of the International Prize in Statistics. -Ace Indian shuttler Saina Nehwal has been appointed as a member of the International Olympic Committee’s (IOC) Athletes’ Commission. It is rare honour for an Indian sportsperson. -Senior IFS officer Amandeep Singh Gill was appointed as the India’s Ambassador to the UN Conference on Disarmament, Geneva. -Eminent writer C Radhakrishnan was selected for the prestigious Mathrubhumi Literary Award for the year 2016. -Four Indian wrestlers have won four medals individually including a gold medal, at the sixth edition of the TAFISA World Games held in Jakarta, Indonesia. -American singer-songwriter, artist and writer Bob Dylan (75) has won the 2016 Nobel Prize in Literature. He is the first American to win the prize since novelist Toni Morrison in 1993. -The United Nations General Assembly (UNGA) has formally elected Antonio Guterres (67) as the new Secretary-General of the United Nations. -Ace Indian Shooter Jitu Rai has won the 2016 Champion of Champions pistol Award of the International Shooting Sport Federation (ISSF) for pistol shooting. -Abdelilah Bekirane was re-appointed as the Prime Minister of Morocco for second term. Benkirane has been serving as Prime Minister since November 2011. -The Union Government is going to commemorate the birth centenary of social activist and former RSS leader Nanaji Deshmukh from October 11, 2016 to October 11, 2017. -Two economists Oliver Hart and Bengt Holmstrom have won the 2016 Nobel Memorial Prize in Economic Sciences. Both of them will share 8 million kronor, or about $930,000. Royal Swedish Academy of Sciences has selected them for their contributions to contract theory which tells how contracts help people deal with conflicting interests. -The 2016 Nobel Peace Prize has been awarded to Colombian President Juan Manuel Santos. He was selected for the prestigious award by the Norwegian Nobel Committee for his resolute efforts to bring the more than 50-year-long civil war of Colombia to an end. -Renowned Manipuri theatre legend Heisnam Kanhailal passed away. He was 75. -Sikkim Chief Minister Pawan Chamling was honoured with prestigious Sustainable Development Leadership Award of the The Energy and Resources Institute (TERI). -Trio of Jean-Pierre Sauvage, J Fraser Stoddart and Bernard L Feringa have won the prestigious 2016 Nobel Prize in Chemistry. Royal Swedish Academy of Sciences has chosen them for this award for their individual efforts in developing molecular machines. These three laureates will share the 8 million Swedish kronor (around $933,000) prize equally. -The Union Government has appointed senior Indian Revenue Service (IRS) officer Sushil Chandra as the Chairman of the Central Board of Direct Taxes (CBDT). -Former ISRO Chairman and space scientist Prof Udupi Ramachandra Rao became the first Indian to be inducted in the Hall of Fame of International Astronautical Federation (IAF). -British trio of physicists David Thouless, F Duncan M Haldane and Michael Kosterlitz have won the 2016 Nobel Prize in Physics. They will share the 8 million Swedish kronor prize. -History writer Nayanjot Lahiri has won the prestigious 2016 John F. Richards Prize for her book Ashoka in Ancient India. -The Union Finance Ministry constituted four-member Insolvency and Bankruptcy Board of India (IBBI) with Financial markets expert MS Sahoo as its Chairman. -Yoshinori Ohsumi (71) of Japan has won the 2016 Nobel Prize for physiology or Medicine for his pioneering work on autophagy. With this he becomes the 23rd Japanese national to win a Nobel prize and overall the sixth Japanese medicine Nobel laureate. -Film-maker and elephant researcher Prajna Chowta (46) has been appointed Chevalier de l’Ordre National du Mérite (Knight in the National Order of Merit) by the French government. -The parliament of Estonia has elected Kersti Kaljulaid (46) as the President of the Baltic country. With this, she became Estonia’s first female president. -Indian-origin South African Kiara Nirghin (16) has won a $50,000 scholarship at the annual Google Science Fair held in United States. -The crown prince of Abu Dhabi, Sheikh Mohammed bin Zayed Al Nahyan will be the chief guest for the 68th Republic Day celebrations on 26 January 2017. -The noted music director and violinist Uttam Singh (68) has been named for 2016 Lata Mangeshkar Award for Lifetime Achievement by the Maharashtra government. -The Union Government has appointed S. Sivakumar as a full-time Member of the 21st Law Commission of India (LCI). -Noted Dalit voice, poet and Telugu writer Prof.Kalakaluri Enoch was conferred with the prestigious Moortidevi Award of Bharatiya Jnanpith for the year 2015. -Former Israeli Prime Minister and President Shimon Peres passed away on 28 September 2016 in Ramat Gan, Israel. He was 93. -Jim Yong Kim has been re-appointed as President of World Bank for a second five-year term beginning 1 July 2017. -Senior IAS officer Arun Goyal has been appointed Additional Secretary in the Goods and Services Tax (GST) Council. He will be the first Additional Secretary of GST Council Secretariat. -India’s squash player Velavan Senthilkumar has won the Under-19 Asian Junior Individual squash championship title. -The Union Government has appointed Navtej Sarna (59) was appointed as Ambassador to the United States. He will take over from Arun Kumar Singh, who has retired from the service. -President Pranab Mukherjee has appointed former IAS officer Alka Sirohi as chairman of Union Public Service Commission (UPSC) as per Article 316 of Constitution. -Union Government has chosen 105-year-old Kunwar Bai from Chhattisgarh’s Dhamtari district as the ‘Swachh Bharat Abhiyan’ mascot. -India’s Devendra Jhajharia (36) has won gold medal in the men’s javelin throw, F46 event held at the 2016 Rio Paralympics. -Deepa Malik has created history by winning silver medal in Women’s shotput at the 2016 Rio Paralympics. -Mariyappan Thangavelu has won India’s first gold medal at the 2016 Rio Paralympics. He won the gold medal in the Men’s High Jump T-42 event with jump of 1.89 metres. -Eminent economist, consultant and banker Dr. Urjit Patel has assumed charge as the 24th Governor of the Reserve Bank of India (RBI). -Noted filmmaker Aishwaryaa Dhanush was appointed United Nations Women’s Advocate for Gender Equality and Women’s Empowerment in India. -Eminent Dogri language Poetess and novelist Padma Sachdev was awarded the prestigious Saraswati Samman for the year 2015.